Gayari: Half a dozen tattered yellow flags poke from a huge boulder-strewn expanse of gravel and ice. They mark where the buildings of Giari army base once stood. In the early hours of April 7, thousands of tonnes of ice, rock and snow crashed down onto the camp, the battalion headquarters of the 6th Northern Light Infantry 4,000 metres (13,000 feet) up in the mountains of Kashmir. 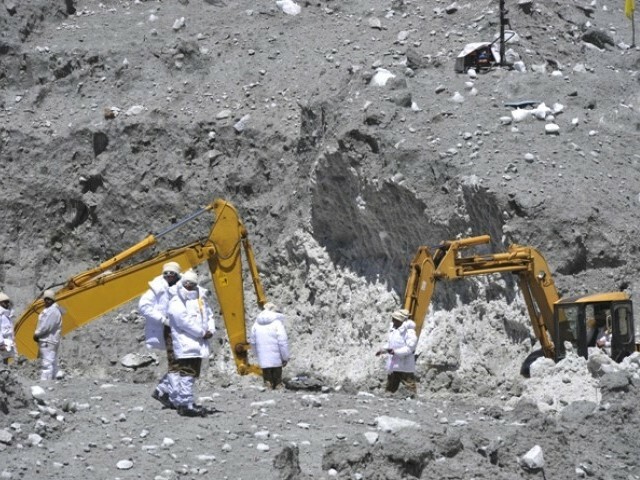 The disaster that entombed 140 people has been described as an avalanche, but the dense, rocky rubble that now covers the camp to a depth of around 60 metres (200 feet) looks more like the aftermath of a landslide. The army has been searching for the 129 soldiers and 11 civilians buried at the remote Giari site for nearly two weeks and they insist they have not yet given up hope of finding survivors. But it is almost impossible to imagine anyone surviving even the initial impact of such a weight of rock and ice, one of the boulders carried down the mountainside onto the site measures at least 30 metres across and 20 metres high. Yet the search goes on, with bulldozers and mechanical excavators, looking like children’s toys against the immense mountains, ploughing through the debris. Faced with the featureless expanse of ice and rock more than a square kilometre (third of a square mile) in area, search teams used army records to work out where camp buildings stood, marking them with yellow flags, to concentrate their efforts there. Brigadier Saqib Mahmood Malik, the Siachen brigade commander, said his soldiers were desperate to help their comrades. “We don’t need morale or motivation. Merely that our colleagues are under it — that is the source of motivation to get them out. I really don’t have to push my men to do this job,” he told AFP. The soldiers’ indefatigability in the face of daunting challenges – sub-zero temperatures, daily blizzards, constant threat of further avalanches – is admirable, but one dismissed the idea of praise. “For you it’s impressive, but for us it’s an enormous tragedy,” he told AFP. There is no question the task the rescuers face is overwhelming – no visible trace remains of the base, which stood on the site since 1988 and was regarded as a very low avalanche risk. It is as if the desolate, saw-tooth peaks that loom dizzyingly over Giari tired of their human tenants and with a single terrifying sweep returned the site to the barren grey-brown monochrome of the rest of the valley. Giari sits just below the Siachen Glacier, known as the “world’s highest battlefield”, where Pakistani and Indian troops have faced off in unimaginably harsh conditions since the 1980s. Both countries expend huge resources maintaining troops at altitudes of up to 6,000 metres and questions have been raised about the value of defending such harsh terrain — and the environmental impact on a delicate glacial ecosystem. Waste from military camps is a major problem, environmental experts say, leaching poisonous chemicals into the glacier and threatening to pollute water systems that millions of people across the subcontinent depend upon. The Siachen feeds into the Indus River and army chief General Ashfaq Kayani acknowledged the ecological damage the ongoing standoff was wreaking. “We understand the physical deployment of troops, that glaciers get affected, the environment gets affected,” he said on Wednesday after visiting Giari. “It does not affect only the Indus River — it affects the environment of this region and it affects in some ways the environment of the world. Since the conflict flared in 1984, more lives have been lost to the cold weather and treacherous conditions than combat. It remains to be seen whether the Giari tragedy will be enough to bring the men down from the mountain. This entry was posted in News and tagged COAS, Gayari, Gayari Sector, ISPR, Kayani, Pak Army, Siachen. Bookmark the permalink.